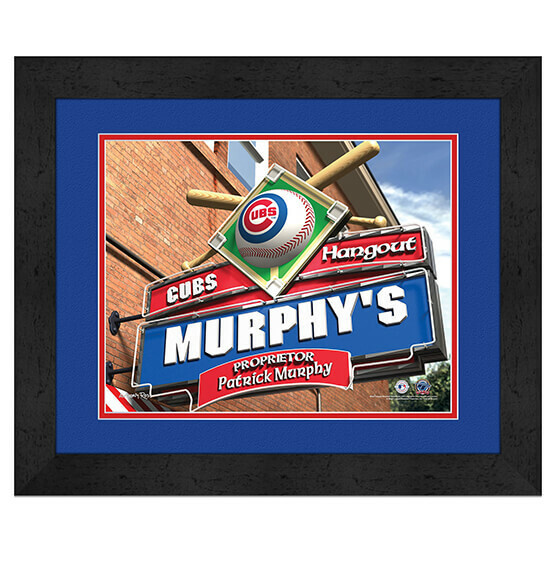 With our fantastic Chicago Cubs Personalized MLB Pub Sign Framed Wall Art, you can have your very own Cubbies hangout right there on Addison Street. This customizable pub sign lets you decide who the proprietor is at the most popular place to sing "Go, Cubs, Go!" Just specify what name you want this hole-in-the-wall establishment to be, and who should be listed as the proprietor! Our made-to-order print is crafted in high-quality team colors and makes a fantastic addition to your Chicago Cubs fan zone. Hang this premium black MDF vinyl-wrapped frame, glass and paper in your home or office with the attached sawtooth hanger. This piece is guaranteed to cement your Cubbies fan status.